I just made this again recently, and quickly remembered why I had saved this recipe! 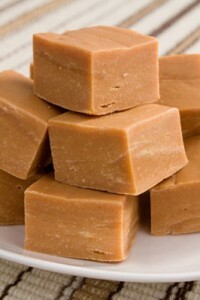 Originally found it somewhere online, under the name “Alpha’s Peanut Butter Fudge”. I made a few modifications, and I believe they improved an already great recipe! Remove from heat and mix in peanut butter. Cool to about 120º F and mix in vanilla. Spread in suitable size pan (the larger the pan, the thinner each piece of candy will be). Fudge will still be very soft at this stage; it takes a few hours to set up. I actually doubled this recipe (because of our large family) … sort of. I forgot to double the peanut butter, but did double everything else, and that was just fabulous. So I would recommend perhaps halving the peanut butter, or if doubling, just use one 18oz jar. Still very peanut buttery … and fantastic! It took about four hours to cool/set, and then was ready to serve!